Villa in Lagos, Lagos - Property for sale. Full Description: An outstanding opportunity to buy not just a property but a lifestyle choice on one of the Algarve's Premier resorts, Boavista Golf and Spa Resort in Lagos. With award winning facilities including an 18 hole championship golf course, golf academy, club house and restaurant, driving range, health and fitness spa, floodlit tennis and football, safe childrens' play area, games centre and numerous activities to suit all ages and interests and much, much more. Complimented by breathtaking views and surroundings all add up to make this a personal haven. One of the off-plan "Properties of Distinction" range is the "Goldfinch". 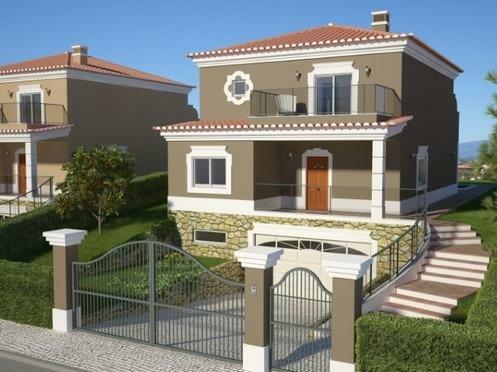 A two storey detached villa with garage under. The ground floor comprises of contemporary open plan lounge/dining room leading to a covered terrace and private garden, kitchen, bedroom and shower room. The first floor has 3 bedrooms all en-suite and with private terraces. Boavista properties are built to a high standard and in compliance with thermal and seismic conditions to the upper grade of the Portuguese Energy Classification. As standard the properties are provided with energy efficient solar hot water heating and inverted air conditioning/heating units in all bedrooms and living rooms. The kitchens come fully fitted with integrated appliances and natural granite worktops. All upper floor bedrooms have vaulted ceilings with concealed LED lights and en-suite bathrooms with underfloor heating and heated towel rails. Electric shutters are on all windows and there is pre-installation of an alarm system. The living and bedroom areas have cable tv, telephone and computer points. The integral garage has electric remote entry doors, the gardens are fully landscaped and can be connected to the resort irrigation system. The properties will have private access to a large pool in a private condominium. There is the option for a private pool at an additional cost on some plots.